What a great idea! I would have never thought to do that! I have recently taken up embroidery and just love it! Thanks for sharing this idea! beautiful! It honestly took me a minute to realize there was a woman under the ship. hehehe I'm going to have to try this sometime! I think this is beautiful. What a great idea. I think I will put it on my list of things to do. I've just recently taken up embroidery and I'm so glad I've found this cute blog! It is so inspiring! 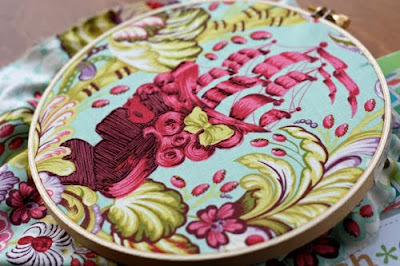 Love the idea of embroidering on printed fabric. Definitely going to do that! What a fabulous idea! Must give this a try! So cool! 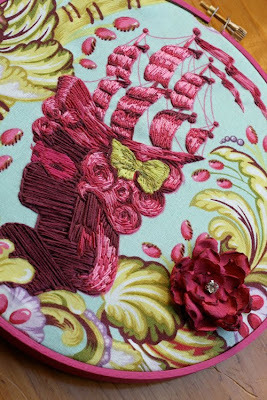 Becky is very talented, and I do love her cameo stitching. I have that book. It is a constant inspiration to me.